This is one of those homemade items I hadn’t intended on making but when I bought a bag of oranges on sale and the Pinterest post I had seen (who knows how long ago!) flashed through my mind as I was about ready to throw the peels out … LIGHTBULB!!! Homemade item … check. Post topic … check. Repurposed (for a little while longer at least … then to the compost or garbage disposal cleaner) waste … double check! I’m absolutely in LOVE with my Norwex products as they meet everyone of our green cleaning needs. However, I feel like this is one of those items I wouldn’t go to the store and purchase or even use to replace my Norwex but would gladly welcome the treat of refreshing orange scented cleaning spray every once in while! A fun fact about me, I really don’t like to use paper towels … there’s something about that excess waste that just breaks my heart every time I finish a roll! (I find it quite humorous how much empathy I have for our disposables! The Mr., bless his heart, just goes along with my recycling tendencies most day!) In general, one roll lasts us about 2 months. We use them very sparingly to drain bacon, soak up the extra moisture from shredded potatoes when making homemade hash-browns, or any other task that would be more of a pain to launder than a towel used to clean up the typical glass of spilled milk. I’m really not sure where this decision grew from, but there is definitely a love-hate relationship I have with convenience, waste, and money. So this lack of using paper towels and my new orange infused vinegar for sporadic cleaning brings a question to mind for my Norwex consultant “Would it harm my rags to wipe up after this spray?” Vinegar and orange oils are all natural … so if anything it could give them a extra cleaning boost if used right before laundering?!?!? Place orange peels in jar. Top off with vinegar. Securely close. Allow to set for at least a week or two. Shake periodically. Day about 7 or 8 … or maybe more! At this point, it is smelling heavenly! At first whiff I get a refreshingly aroma of orange and then if I get my nose a little too close I get a whiff of vinegar. A few tweaks for next time … more oranges or less vinegar just to allow for the orange to completely “out smell” the vinegar. Definitely not a deal breaker and will be using this as soon as it’s ready! I plan on giving this a few days when all of the orange peels have settled to the bottom of my jar. 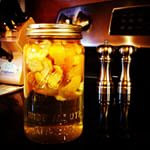 There really is no right or wrong way to make infused vinegar but I loved My Merry Messy Life‘s additional suggestion for using the peels to cleaner you garbage disposable; as well as The Peaceful Mom‘s thoughts on cost and diluting it. My thoughts are exploding with different scents to infuse here … lemon or mint or grapefruit, OH YUMMY!